The common tree snake (Dendrelaphis punctulata), also called green tree snake and Australian tree snake is a slender, large-eyed, non-venomous, diurnal snake of many parts of Australia, especially in the northern and eastern coastal areas. This common snake is harmless, readily recognized as it is an agile snake with a very slender body and tail. The body color varies from green to olive-green to black, sometimes even blue. 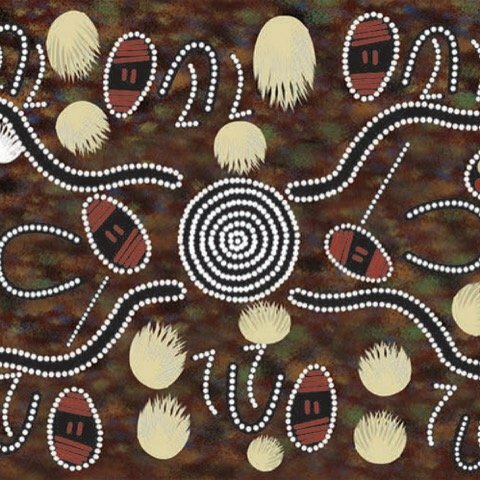 The rain serpent is a common motif in Aboriginal artworks. When a rainbow is sighted in the sky, it is said that the serpent is moving from one waterhole to another. For this reason, some waterholes get never dried. 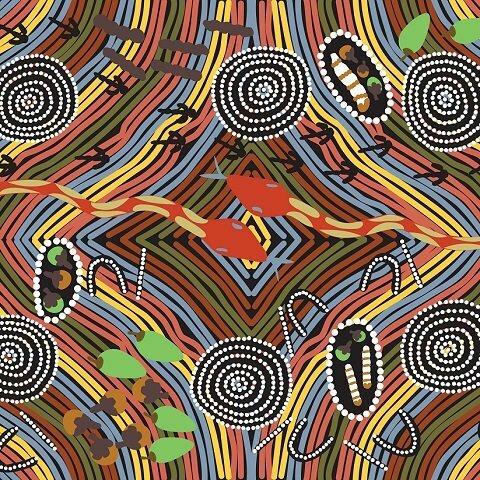 Dreamtime:The Rainbow Snake is a common motif in Aboriginal arts in Australia. 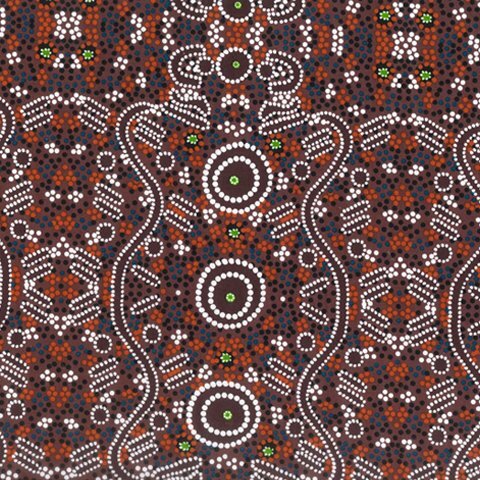 Dreamtime stories tell of the great spirits during creation, in animal and human form they moulded the barren and featureless earth. The Rainbow Snake came from beneath the ground and created huge ridges, mountains and gorges as it pushed upward. 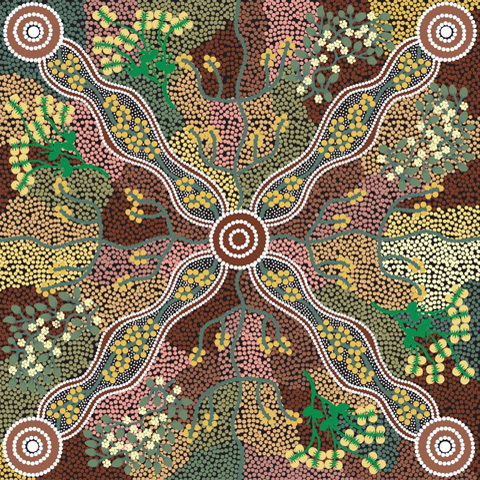 There are numerous stories associated with the snake, all of which communicate the significance and power of this being within Aboriginal traditions. The snake comes in male and female form. Yingarna, the female, is the original mother of creation, and her son Ngalyod is the great transformer of Land. The Rainbow Snake is one of the oldest religious symbols of Aboriginal Culture. Audrey Napanangka is a very well-known Artist. 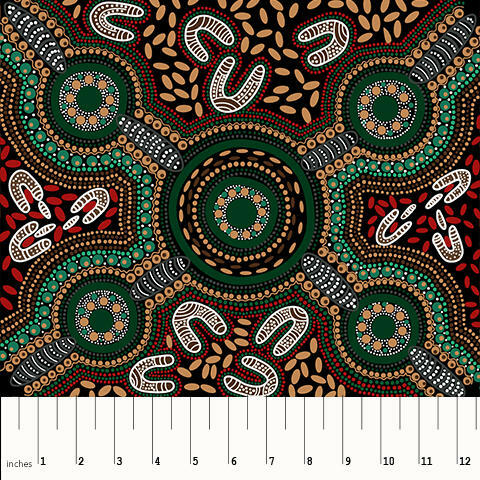 Many of her art works have been printed on textile materials by M&S Textiles Australia. She skilfully painted her dreaming; i.e. Water Dreaming. In Desert areas of Australia, it is hard to find water. 90% of water comes from underground. Audrey’s experience in the bush tells her where and how to find drinking water in the waterholes. The long curved lines indicate the movement of water in the area. Dotted lines and smaller circles indicate various soakage’s, broken roads, sands, etc. Many Aboriginal people live in open areas near the bushes. Water has been their most wanted commodity for living in or around the bush. However, most people living near the bush know how and where to find water. They have good knowledge of waterholes, ponds, river water, billabongs etc. Aboriginal Ceremonies are generally held near the waterholes. Faye Oliver is an experienced and well established artist. She worked at Keringke Art Centre for about six years, as an assistant art co-ordinator. Her artworks have been exhibited in various countries. She also received a number of art awards. Through her works, she tries to bring harmony in the community. The expression of modesty can be seen in her works. She believes in trust and peace in the community. Faye's artworks are colourful, neat and beautiful. She learnt painting from sister Edith, one of sacred heart nuns. 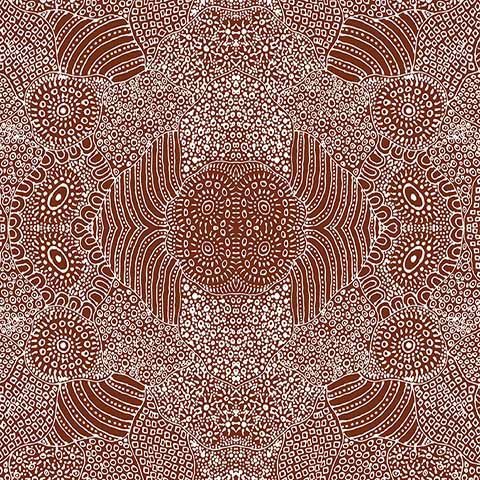 In this design, she depicts sacred women (healers) moving around the bush in groups, singing scared songs, collecting different types of medicinal herbs and leaves. Some women are digging for the medicinal roots with their digging stick. They use these medicinal plants to heal the wounded. Bush Tomato or wild tomato plant is usually waxy looking. It grows in the creek area in Northern Territory. The ripe fruits have a strong fragrance which may be smelled from long distances. A single plant produces many fruits. These fruits are tasty. Bush Tomato is rich in sources of potassium and vitamin C. There are more than 100 varieties of bush tomatoes, but only a handful numbers are edible. Some may be poisonous or may cause sickness. Harvesters normally collect sundried fruits of the small bushes in the late summer and early winter. Audrey Napanangka?s artwork is vivid and strong. Design shoes women(u) are sitting around waterhole with already picked up fruits on the coolaman (Special wooden toy) and digging sticks. © Lee Nova Pty Ltd. ABN: 66002523104. This page updated 29 January 2019.